PSC’s work to improve working conditions and job security for CUNY adjuncts received prominent coverage this week in the New York Times and NBCNews.com. In the NY Times, see “Crowded Out of Ivory Tower, Adjuncts See a Life Less Lofty” by Rachel Swarns, author of a column called The Working Life. On NBCNews.com, see “Class divide on campus: adjunct professors fight for better pay, benefits” by Nona Willis Aronowitz. Job security for adjuncts is a priority demand for the PSC in the current round of collective bargaining for a new contract. The stories (submit yours at psc-cuny.org/JobSecurity) are being collected to support a campaign for adjunct job security. They may be shared anonymously with media, reported in testimony or offered to inform the contract negotiations. How Hasn’t Job Insecurity Affected Me? "..With no income, I went on food stamps. It was the most humiliating, dehumanizing experience of my life; not only the idea of it as someone who grew up in the middle class, but the way I was treated by the Department of Social Services. My case was badly mishandled...The situation was only rectified once I involved my local councilman's office. It took six weeks. I don’t know, but I think at least some of the problem was because the people I dealt with didn’t believe that a college instructor would need food stamps. I can’t believe a college instructor would need food stamps. I only told the closest people in my life..." Read more. "...Each semester I have a knot in my stomach until about a week before classes begin worrying whether or not I'll have a job..." Read more. "...It has been extremely stressful for me having lost my position of 8 years and having the person who hired me at BMCC 16 years earlier tell me that I am no longer desirable. Favoritism was played in the department where those who had taught fewer years than I had been given full-time substitute lines while others, new to the department were given one section while my third section was eliminated from my schedule..." Read more. "This semester I received a letter saying that the [department omitted] had not approved my employment for the fall semester. Just like that, no explanations were given. Now I have no income whatsoever and to make things worse, I cannot claim unemployment...even during employment as an adjunct I wasn't qualified for any health insurance benefit..." Read more. "...A few years ago, I was asked in late September to teach 2 courses in the spring and I agreed. After Thanksgiving, one was taken away. No other course was available for me. This meant that I had to pay my own health insurance - nearly $750 per month that I hadn't budgeted for, from February through August. I was also told there was only 1 course for me in that coming fall semester. So, in August, I sent emails to every branch of CUNY asking for another course, and I was very fortunate to find one. I spent that fall semester rushing between two campuses for the health insurance..." Read more. "...I never know until a few weeks before school begins if I have classes or not. It doesn't give me enough time to try to locate another class elsewhere. I depend on my income from these classes and it is terribly stressful to try to cobble together work at the "eleventh hour." I also depend on enough hours to qualify for the adjunct health insurance..." Read more. "..Last year, my chair emailed me to offer a series of courses, and when I eagerly accepted, hopeful that I would be able to make enough money to get through the semester, she informed me that her initial job offer had actually been a mistake: she meant to send the email to someone else. I was stunned and received no apology. This kind of event is representative of the tone of my treatment by the department..." Read more. "I am an adjunct professor who teaches 1 college class at 3 separate schools (2 CUNY schools, 1 SUNY school). Every semester, I count on this money to help support my family. I just gave birth in late May (planned so I wouldn't miss my work or payments in the spring), and I wasn't able to teach this summer because of my child. We took a huge financial hit..." Read more. "...How can we provide any kind of quality education when we are being paid so little? We resent students when they make extra demands from us, because we are not getting paid enough to properly instruct them. We read homework late because of overwork & underpay. We battle with university bureaucracies just to get an office space for a couple days a week or to get access to university resources. We get assigned the most undesired time slots (really early in the morning or very late at night, sometimes both with many hours between classes.) Our personal relationships are strained because we are stressed; we resent our colleagues who are able to take on less work or who are assigned less work for the same pay. Full-time faculty have absolutely no idea what we go through -- they always seem shocked when we tell them about our financial situation..." Read more. "...Years ago I was a graduate student at CUNY-GC and was teaching as a lab instructor for Introduction to Physical Anthropology at Hunter College... Lab instructors had to come in at least half an hour before the lab begins to set up lab materials and it took another half hour after the lab to dismantle the specimens and equipment, we never got compensated for the amount of time we spent preparing the labs..." Read more. "...If you are reading this and have a full-time permanent job, the best way to convey an adjunct's' story is just to imagine you are not---imagine instead that you are..." Read more. "Prior to the Fall 2013 semester I was asked to teach three courses at York. Unfortunately, our program had been hit hard by Pathways initiation which readjusted our classes from a required core curriculum to a flexible core. We expected enrollment to be reduced but we were truly surprised that it was immediately cut in half..." Read more. "I was hired by the chair of my department six years ago. We had an excellent working relationship. Unfortunately, he passed away suddenly. I felt that my job would be threatened at the time as I did not know whether the new chair would be as supportive..." Read more. "...The quality of your work, and what you can offer students, suffers because of the tentative nature of your employment." Read more. "...when you don't know if you're going to have a salary in a month, or health insurance--you always plan for the worst..." Read more. "...Being out of work in a given semester is not only an embarrassment among peers but, it puts the adjunct “out of the loop” that would otherwise enable one to at least keep up to date with mandated changes. Such lack will clearly affect the quality of preparation for the next semester in which one does have assignments. When you’re “out of the loop,” you’re done for professionally, and loyalty is damaged if not destroyed..." Read more. "...I never know from one semester to the next whether or where I will be employed. It makes it impossible to plan for the future. If I had children I don't know how I would cope..." Read more. "I've been an adjunct for over 13 years, since I was in graduate school, initially to earn money while I looked for a "real" full-time job as a CUNY administrator. I’ve earned an MBA and a master’s degree in anthropology in that time. My career aspiration had been to be a program manager or administrator in the CUNY system, not a professor..." Read more. "As a PhD student at the GC, I rely on teaching within CUNY every semester for extra income, but mainly as the only job through which I get health insurance. I never know from semester to semester whether I will get a course or whether the course I am scheduled to teach will run. Frankly, it's so anxiety-producing that I am trying to get a second course at the other university I teach at..." Read more. "...I consider myself to be a thoughtful, honest, and fair grader of student work with many years of experience as a teacher. Being questioned... by my supervisor... has put me in a defensive and vulnerable position..." Read more. "...I think I'm seen as a trouble maker for some, champion for others and I just wanted to teach....I think my former colleagues are afraid to be publicly associated with me..." Read more. "...I lost my Empire Blue Cross health coverage. I am teaching only 3 credits now... I pay for health insurance through Medicare and AARP. Almost $600 month. So I am working to pay for my health insurance, at this point...." Read more. "...I love my students, respect my colleagues, and believe in teaching my students, but I'm being driven out of the profession by a system that divides faculty into princes and paupers.... The regular pay raises of university presidents are especially insulting when courses essential to majors are being cut for "lack of funding."..." Read more. "...When I first started, I was given three classes each semester. I received health insurance after the required amount of time. After a few years, I was only given two classes each semester. In the 1990's my department head decided to give one of my classes to her friend. I lost my insurance for that semester. Her friend only stayed for one semester, and I was given my class back. After many years, my head told me that she wanted to cut me back to one class because she wanted to try new people out. I had to "beg" to keep two classes..." Read more. "I was hired in 2010 to teach at Hostos Community College and every semester is a wait and see adventure, because I don't really know if I will have enough students for my courses...This past summer I had 7 students registered, but that is too low so the weekend before the class was to start, it was cancelled...Since I became a student at the GC, I have had a terrible time getting paid on time at the beginning of the year..." Read more. "...Emotions fluctuated between 'glad to be rid of...' and 'it will be ok, I can find other work...' and 'don't be afraid, there will be other jobs where you will be recognized/acknowledged...' etc. I always try not to be cynical about these matters...have worked on developing a positive perspective on life though at times it may be populated by thoughtlessness from others. I remind myself that I also have been thoughtless in my own life..." Read more. "...This whole insurance issue for adjuncts has been extraordinarily stressful. We are a part-time work force--for a multitude of reasons (mine being that I'm also a MOM). That does in no way whatsoever mean that we are any less professional or any less committed to quality education for CUNY students..." Read more. "...This past fall the course became "obsolete" due to Pathways, so they cut the offerings to 6 sections. Instead of letting the new hires go, the cut all of the existing adjuncts to 1 class each for 4 hours/week..." Read more. "...I'm teaching a total of 7 classes with around 200 students (three of the classes are within the CUNY system and are all here at [college omitted]). I have no time for much of anything beyond teaching, preparing lesson plans, and grading. Since the beginning of this term, I work 7 days a week putting in typically 8 to 12 hours a day. For one particular day, I am going from 7am to 9pm..." Read more. "...until I am actually in front of the class, I am not certain I will be employed..." Read more. "...Colleges openly violate the contract or find ways around it. Adjuncts are disposable cannon fodder, collateral damage, cheap part-time labor..." Read more. “…news reporting generally says how bad adjunct teaching is… one always knows that adjuncts are un-hirable…” Read more. “… in order to have any sort of long term stable teaching position, I needed a faculty job, thus I abandoned adjuncting and joined the doctoral program at CUNY…” Read more. “…The adjunct room can only accommodate 2 or 3 yet there are more than 40 adjuncts. No adjuncts meet with students despite the fact that we are paid to have office hours…it would be nice if adjuncts…were treated like you were part of the faculty team…” Read more. “…It is difficult to prepare for classes at the last minute, and I often have to prepare for three very different classes. I have taught a wide variety of literacy, child development, early childhood, research, and other classes (both graduate and undergraduate) and supervised student teachers…” Read more. “…I have been an adjunct for 5 years. I never had a fellowship so I have always been in the last group of adjuncts to be assigned, and as such, am never assured that I will be able to teach a class that fits in with my schedule, much less one that I have experience teaching…” Read more. “…I'm one of the few mad ones I know who hasn't gotten around to considering dropping out and moving on. I just struggle on, try to get things done, and wonder if and when I'll be applying for Medicaid again…” Read more. “…I do not understand why we cannot teach as many courses as need filling at our college. I think that adjuncts who have been there longer should have priority based on seniority and we should be given at least 9 credits each. Now, the most one gets is 2 classes (6 credits)…” Read more. “… when I look at my bank account, I wonder why in the hell I do it and why the hell I am getting a PhD. I ultimately try to not let this affect my classroom performance…” Read more. “…Pathways eliminated the requirement of courses my department…adjuncts will be the ones to not be rehired when we run out of classes…I don't know where I will find another job.” Read more. “…My inability to plan an annual household budget causes my family stress …No family should have to worry whether they can pay rent.” Read more. 'Marked' by Going to the Union and Winning My Case? “…I found out that student evaluations…were not considered…I went to the union's grievance counselor with all my documents and went through step one grievance and got my courses back…” Read more. “…In the back of my mind there is an anxious feeling that my income could be cut, and even worse my health insurance. This insecurity is always there and it is not reasonable…” Read more. “…I have been working at [college omitted] for 12 years and this investment does not provide any job security. It does not even provide the possibility of acquiring a professional job at another school. ” Read more. “…The short notification for course assignments obviously affects my ability to pre-plan or restructure my courses. I often need to rely on previous material, and the financial stress has been a constant.” Read more. 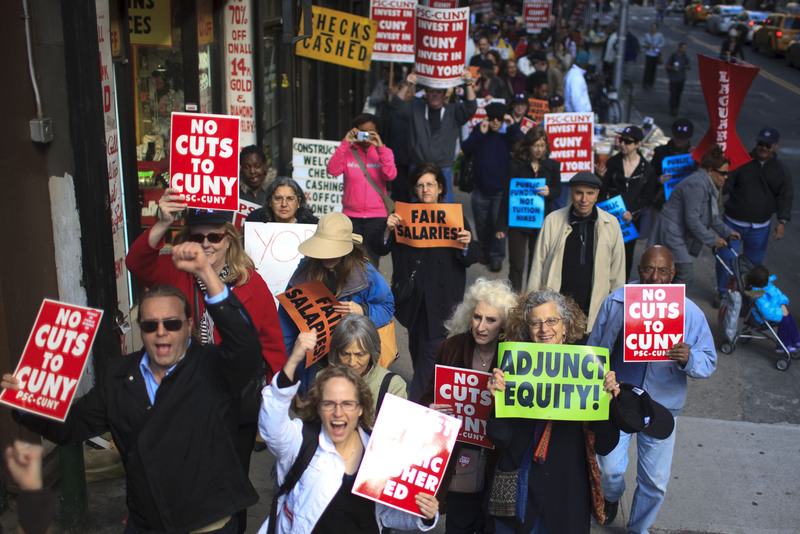 "As an adjunct at CUNY all is unpredictable as many chairpersons change and they tend to have their own program in mind and that may not include an adjunct already teaching. I cope with unforeseen scheduling by having another position or skill to call upon." "...My coordinator has given off verbal signs that my course load will be limited starting in the spring. There is no real communication...I have experienced odd weekend or early morning hours. Some classes have been cancelled. I adjust accordingly and try to survive. Overall, the isolation and inherent hostility does affect my teaching..." Read more. "...At the beginning it was always hard because I was assigned [my classes] at the last minute...This really impacted my life in term of scheduling and finding other jobs. In terms of class performance I have always done my best, but I feel that I have no say about my working conditions..." Read more. "Days before a semester begins one is afraid to answer the phone or read one's email. I have had classes cancelled or suddenly been called upon to teach when the semester had already started... It a shot to one's self-image to be teaching a full course load and to be earning less than poverty wages..." Read more. The biggest problem for me is if a class does not enroll, they do not find another class for you. There is no plan B. I had a class this term that did not enroll, it was canceled in July (!) and then no plans were put in place for another class. Since school was not starting until late August, and registration was not over until then, I don't see why that cannot be done. "...I'm hired on a semester-by-semester basis, with no guarantee of continued work. After each semester, I receive a form letter stating the administration will be "pleased" to hire again me next semester -- IF there is space, time, interest, resources, etc. ...no stability exists for me in the CUNY system, and the system works against me and my interests." Read more. "Every summer there is at least one half of the time where we are NOT working but unable to collect unemployment benefits because we are "guaranteed" a teaching position in the fall term..." Read more. "I was lured to [college omitted] on the promise of a full-time position,someday, and have been an adjunct since 2011. I love the students. But, I never know how many courses I will be teaching, or which ones. Classes under-enroll and are cancelled. As I can teach anything in theater, and also public speaking, I am moved around at will, but am under-utilized..." Read more. "...I have applied to every CUNY school [department omitted]. I am unable to find work in other schools and departments, and at the same time, I am not accruing enough seniority at [college omitted] to obtain at least the promise that I will be able to teach two courses per semester so that I can keep my insurance..." Read more. "...Imagine planning a wedding, not knowing whether the bride or maybe the groom will not shown up. Except this is not just for one day, this is planning for every class meeting..." Read more. “…I work full-time but earn barely above part-time wages. While I take my professional responsibilities very seriously, and have always enjoyed a fine reputation as an instructor, the constant concern I face about getting classes, especially in winter and summer session, has taken a tremendous toll on my morale…” Read more. “…Why can there not be better/clearer class registration for students so that adjuncts could respectfully function as CUNY educators?...” Read more. “…based on whether or not there would be enough students enrolled, as well as if the classes of full-time staff would be filled. If those classes did not have enough students, the full-time staff would be assigned to my class…” Read more. “…My wife and I…are in the process of buying a Co-op Apartment in Queens. For the first time, I am very nervous about my employment situation…Due to the unpredictable nature of my work, it is very likely that we will not be approved to buy a Co-op…” Read more. “…Not knowing where I stand, if I will be back, diminishes confidence and creates a distance between me and the other faculty…” Read more. “…we are here for one purpose and one purpose only, the convenience of the Department. If we are secure it is because we are meeting a need…” Read more. “…Insecure as the microwave in the adjunct office, which once had a sign on it that read something like, “if you do not use the microwave properly it is going to be taken away…” Read more. “…Coping with unforeseen course work scheduling changes/or cancellations is something I can see being a problem…I do not have alternative plans in place.” Read more. "..In the [department omitted] department at[college omitted] I rarely get my classes ahead of time. They often don't assign classes to adjuncts until a week before the semester starts...ot knowing throughout the entire summer and winter breaks how much money I will be making once the semester starts, or even if I have a job, is extremely stressful..." Read more.